This is my absolute favourite vanilla cupcake recipe adapted from my absolute favourite cupcake cookbook (and that’s saying something because I have A LOT), ‘The Crabapple Bakery Cupcake Cookbook’ by Jennifer Graham. I’m not paid or employed by them (promise!) but I have tried so many cupcake recipes in my time, and have found this book to contain many of the best (as well as providing fabulous decorating ideas). Anyway, now my spruiking is out of the way… This vanilla cupcake recipe produces cupcakes that are full-flavoured, not overly sweet or cloying with a beautiful, delicate texture. You can ice them any way you like – I love vanilla buttercream, but you can just as easily ice them with chocolate icing, plain glacé icing or fondant icing as I have done directly below. Perfect for birthdays, picnics, afternoon teas or anytime you have a hankering! Spoon mixture into the patty pans (filling each about 3/4 full) and bake for about 18-20mins or until the top springs back when touched. Remove the cupcakes from the trays immediately and cool on a wire rack for at least half an hour before icing. To make the frosting, cream the butter for 1-2 mins in a large bowl using an electric mixer. Add the milk, vanilla and half of the icing sugar and beat for at least 3 mins (until the mixture is light and fluffy). Add the remaining icing sugar and beat for a further 3 mins or until of a spreadable consistency. Add extra milk if too dry or extra icing sugar if too wet. Add colouring/flavouring and beat in until combined and the desired colour/flavour has been achieved. Using a knife or piping bag, apply buttercream to cupcakes or cake and decorate as desired. 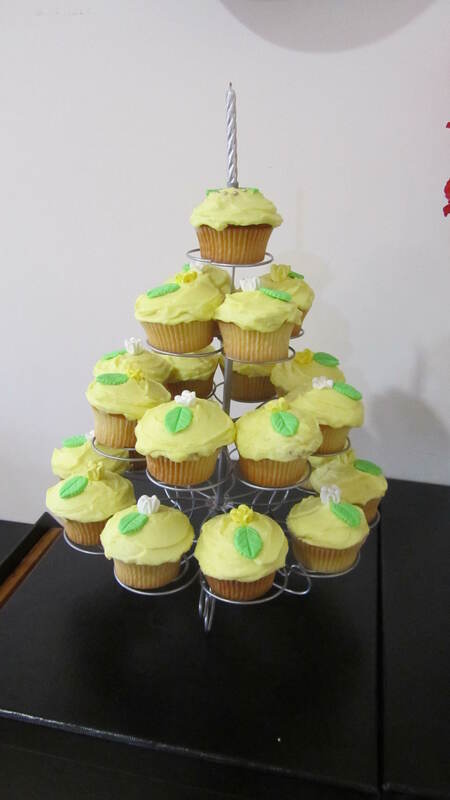 (I’ve used sugar flowers from the supermarket along with green leaves made from fondant icing). Recipes adapted from The Crabapple Cupcake Bakery Cookbook.